Three days after a mentally-deranged man - whose backyard in Arizona featured a bizarre shrine decorated with a human skull and rotted oranges - killed six people and severely wounded Democratic Congresswoman Gabrielle Giffords, the liberal media continue to cynically link Sarah Palin, the Tea Party and mainstream conservatives with the crime. There is, of course, absolutely no evidence that "heated rhetoric" in any way motivated Jarred Loughner's shooting spree, but the media's repeated association of political speech with the attack suggests an attempt to exploit the tragedy to discredit mainstream conservatives by smearing them as somehow culpable. "Giffords was one of 20 Democrats whose districts were lit up in cross-hairs on a Sarah Palin campaign Web site last spring," CBS's Nancy Cordes declared Saturday night in referring to a political map, adding that "Giffords and many others complained that someone unstable might act on that imagery." Hours later on CNN, Jessica Yellin admitted "we don't know the motive" before proceeding to raise how "on Twitter and Facebook, there is a lot of talk, in particular, about Sarah Palin." On Sunday's Today, leading into a clip about Palin, NBC's Kelly O'Donnell asserted: "Giffords, a conservative Democrat, was concerned about heated campaign rhetoric from the Tea Party." An editorial in Monday's New York Times justified the focus on conservatives: "It is legitimate to hold Republicans and particularly their most virulent supporters in the media responsible for the gale of anger that has produced the vast majority of these threats, setting the nation on edge." But while the liberal media indict Palin and other conservatives, there's a long list of vicious rhetoric coming from media liberals. MSNBC has been the most venomous, a fact NBC has glossed over in its coverage castigating conservatives. The network's 8pm ET host Keith Olbermann in 2009 referred to columnist Michelle Malkin as "a big mashed-up bag of meat with lipstick on it." Hardball's Chris Matthews fantasized about the death of Rush Limbaugh: "Somebody's going to jam a CO2 pellet into his head and he's going to explode like a giant blimp." The outrage evidenced this week was not to be found when a film festival showed "Death of a President," a movie depicting the imagined assassination of President Bush. "Poor taste or, as some say, thought-provoking?" MSNBC daytime anchor Amy Robach mildly wondered on September 1, 2006. 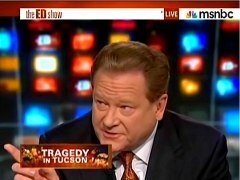 On Monday's The Ed Show, MSNBC's 6pm ET host Ed Schultz pointed his finger at Fox News for supposedly inciting its audience to "think that doing something radical is the right thing to do," but sidestepped his own history of shocking comments. "I get passionate, but not in a violent way," Schultz insisted. HBO's Bill Maher, a favorite guest on CNN and other supposedly respectable news networks, wished for the deaths of both Limbaugh and Cheney. Talking about the then-Vice President in 2007, after al Qaeda exploded a truck bomb at a base in Afghanistan near where Cheney was visiting, Maher argued: "I'm just saying if he did die, other people, more people would live. That's a fact." In 2008, Maher morbidly suggested Limbaugh would have been a better candidate to have died from a drug overdose: "Why couldn't he have croaked from it instead of Heath Ledger?" Among the claims this week is that anti-government rhetoric is putting public servants in peril. If such a dubious claim is true, MSNBC's Keith Olbermann was jeopardizing lives when he teed off against the government's anti-terrorism policies in 2006: "We now face what our ancestors faced at other times of exaggerated crisis and melodramatic fear-mongering: A government more dangerous to our liberty than is the enemy it claims to protect us from." Media gadfly Arianna Huffington made her own plea for civility, telling the Washington Post via e-mail this weekend that "there are lots of ways to be lively and put forth a strong opinion without demonizing one's opponent....It's the demonization that is the problem." But her Huffington Post blog site has demonized conservatives for years, including an item posted in early 2007 mocking the cancer that would eventually take the life of White House press secretary Tony Snow. Sneered San Francisco radio host Charles Karel Bouley: "I hear about Tony Snow and say to myself, well, stand up every day, lie to the American people at the behest of your dictator-esque boss and well, how could a cancer NOT grow in you. Work for Fox News, spinning the truth in to a billion knots and how can your gut not rot?" The Left has been trying for years to shut down conservative radio and otherwise criminalize conservative speech. 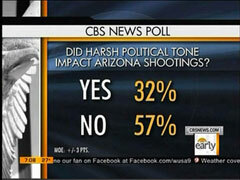 Using this tragedy to further that agenda is beyond cynical, and probably counterproductive: a new CBS News poll finds that even after a weekend of anti-conservative propaganda, 57% don't think "harsh political rhetoric" had anything to do with the shootings. But if the media insist on having a debate about political speech, they need to focus on the Left's vileness as well. Otherwise, they're just partisan hypocrites joining in the exploitation of tragedy for political gain.